Fox News debate: Without Trump, here’s what to expect. 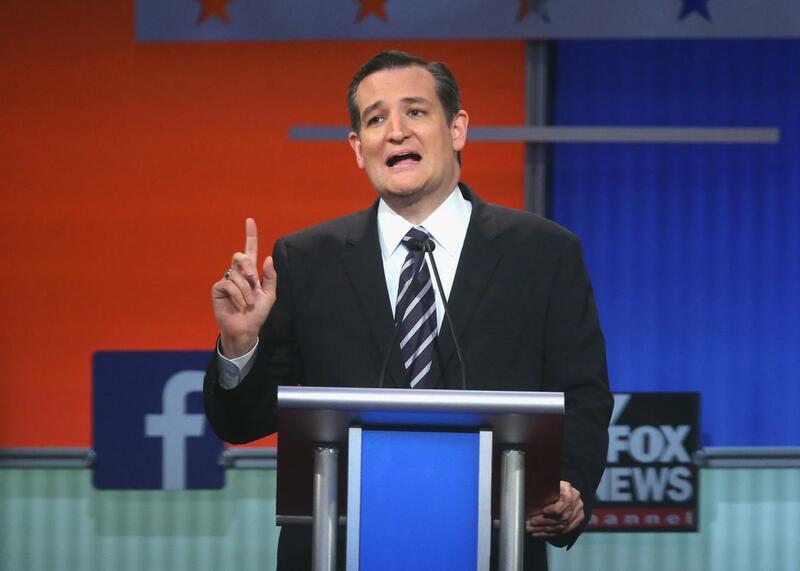 Republican presidential candidate Sen. Ted Cruz fields a question during the first Republican presidential debate hosted by Fox News on Aug. 6, 2015. Sadly, Fox News and the Republican National Committee say there won’t be an empty podium in the middle of the stage to represent Trump’s absence. But even without a political totem, the GOP front-runner’s presence will still be felt. Trump is leading the polls in Iowa, New Hampshire, and South Carolina, raising the very real possibility that he could sweep the first three nominating contests of the year. At this point, you just can’t talk about the Republican nomination without talking about Trump. The question for the seven candidates on stage, then, is how much they want to talk about the MIA mogul. If they mention Trump only in passing, they risk giving him a status quo preserving free pass. But if they hit him too often, they risk turning a Trump-less debate into a debate all about Trump (itself an exercise in status quo preservation). Walking that tightrope would be difficult if the candidates were moving in unison; it will be that much more so given each will show up on Thursday with his own agenda and game plan. The Trump question isn’t just one for the candidates, either. Fox News moderators Megyn Kelly, Bret Baier, and Chris Wallace will need to decide how much time they want to devote to a candidate who has declared war on them. The trio did a great job at the first GOP debate way back in August—but their tough, fair questions had the opposite result of what many expected: As opposed to taking Trump down, that debate (and the ensuing Trumpian spin) only built him up. I doubt Kelly needs any more advice on how to handle the former reality television star, but if I were behind the Fox News desk in Des Moines, I’d wait at least a round or two before mentioning Trump’s name. You can’t pretend the GOP front-runner doesn’t exist. But you don’t need to give him top billing in a show he’s refusing to take part in. Trump’s latest publicity-seeking gambit will have a major impact on his chief rival in Iowa, Ted Cruz. Trump’s absence will leave the Texas senator as the only front-runner on stage—something that should earn him a few more broadsides from his polling-challenged rivals than he otherwise might have faced. Most of his fellow GOP hopefuls will have other things on their minds (namely: each other), but Cruz’s current position in New Hampshire will be more than enough of a reason to attack him. If Rubio and co. do train their fire on the Texan in unison, it would remind viewers at home just how few friends Ted has among his fellow Republicans, something Trump has taken great pleasure pointing out in the past few weeks. Normally, Cruz would wear that as an anti-establishment badge of honor, but that becomes an awkward proposition now that he’s trying to convince Iowa Republicans that they should caucus for him for the good of every GOP candidate not named Trump. Still, the debate provides Cruz with a prime opportunity to make his closing pitch to Iowans without having to worry about Trump offering a well-timed rebuttal or belting out “O Canada” on stage. Meanwhile, if Cruz can successfully parry any attacks that do come his way, he could win converts among an electorate that loves a winner. Look for him to repeat his one-on-one debate challenge to Trump to suggest that the GOP front-runner isn’t as tough as he claims to be, and to argue that his rival’s Fox News boycott is just an attempt to wind down the clock before the caucus. (He’ll also be able to tout his evangelical support without having to worry about Trump butting in to hype his own support from the same group.) Will any of that work? Maybe—but it’s just as likely that the night provides yet more evidence in support of the idea that you just can’t convince a Trump supporter to stop supporting Trump. Iowa looks like a two-man contest between Trump and Cruz, but the caucus will still go a long way toward shaping the race within a race that will happen in New Hampshire eight days later between the establishment-favored foursome of Rubio, Kasich, Bush, and Christie. Rubio, in particular, is banking on a strong third-place finish in Iowa to propel himself to second place in the Granite State (followed by, in his mind at least, a first-place finish in South Carolina later in the month). His party-approved rivals trail him by nearly 10 points in the Iowa polls, but they don’t need to best Rubio in the final caucus standings, they just need to blunt any momentum he does have coming out of Iowa. Thursday night offers a chance to pre-emptively do that—particularly for Kasich, whose current New Hampshire hot streak would be in danger of going cold if Rubio outperforms expectations in Iowa. Rounding out the main event will be Paul, who’s back in the prime-time lineup after failing to make the cut at the last debate, and Carson, who continues to poll in fourth place both nationally and in Iowa for reasons that I can’t begin to explain. Expect Paul to come out swinging, and for Carson to stay mostly silent. Given what we’ve seen so far, also expect neither tactic to get either noticed.